Sew what's cooking with Joan! : JJ's Easy Lemon Bars-What Can I Bring?? "What can I bring?" Are those the words that tumble out of your mouth automatically after, " Yes, I would love to come"? I will be giving you recipes, that you can make and take, in the months to come, under the title, "What can I bring?" Springtime~ It's one of our favorite times of the year. Our yards are ablaze with seasonal color, from the bright yellow daffodils, with their large trumpet in the center, surrounded by the tubular, flat, circle of petals that surround it, to cherry blossoms popping out on those once bare limbs of our trees. The Dog Wood tree blooms, the multi colored tulips, beautiful purple and lavendar crocus, it is all our sign, "It is Spring"! Springtime is also ablaze with celebrations of the season, that lure us outdoors. Today, I am offering a simple dish, that you can tote along to that Spring Time event. Preheat oven to 350 F and position rack in center of the over. Butter a 8" square pan. Whisk together 1 cup of the flour, 1/4 cup of the confectioners sugar, the zest, and salt in a medium bow. Cut in the butter with a pastry blender or a fork, until the mixture resembles coarse crumbs. Knead the dough in the bowl until it begins to come together. Press the dough into the baking pan, and bake for 25 minutes, or until light brown. Let it cool, while making the filling. Mix together the remaining 1 1/2 cups of confectioners sugar, the remaining 2 tablespoons of flour, and the baking powder in a small bowl. Beat the eggs with an electric mixer on high speed in a medium bowl, for about 2 minutes, until about triple in volume. Reduce the speed to low, add the sugar mixture, and beat just until blended, scraping down the sides of the bowl. Add the lemon juice and beat again, until blended. Pour the lemon mixture over the warm crust and bake for 18 to 20 minutes, until the filling is just set in the center. Let cool. After cool, and just before serving, lightly sift confectioners sugar over the lemon squares and cut into 2" squares. This is my daughter-in-law, Amy, who made three different kinds of cookies for our pizza party. The lemon bars are toward the back of the elevated platter. She is a delight, and is the newest adult member to our ever growing family. She is always wanting to learn and jumps right in to help in the kitchen. We call her "Sweet One"! But, don't let the name fool you. She is an athlete, and proved that on a trip to Banff last year. 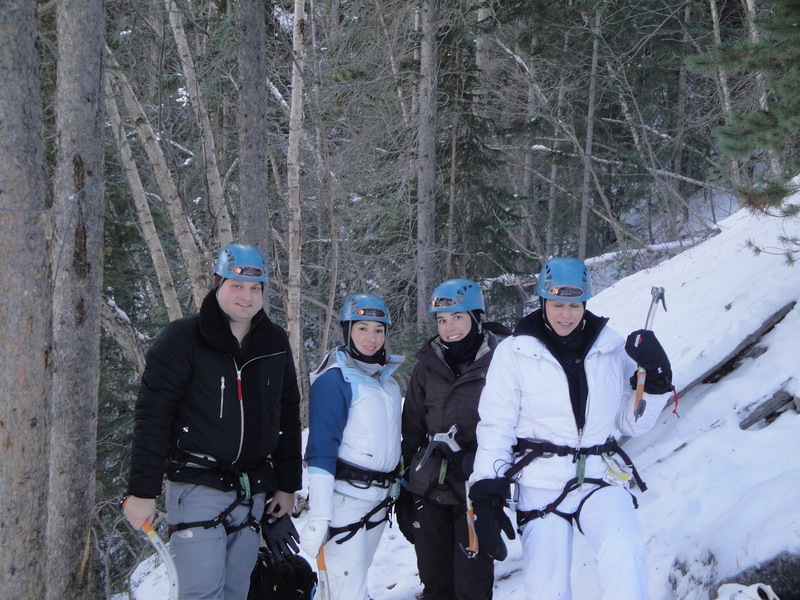 My son, my daughter, daughter-in-law and I, were skiing for a week in the Banff area, we decided to purchase an adventure pack, that took us hiking on snow covered trails and frozen creek beds through beautiful mountains and frozen waterfalls. 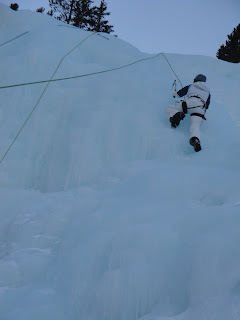 We saw ice climbers, on many of the waterfalls. I said to my son, "that looks fun, I think we can do that"! Out came the Iphone and the next thing we knew, WE WERE ICE CLIMBERS! Sweet one (Amy), took on the falls, like a walk in the park! She scaled the waterfall like a gazelle, we were so amazed by her athleticism, we almost forgot to snap a picture!! We all took several turns at climbing and declared this to be the most fun on the trip. Of course, besides being together! This is Sweet One scaling the Falls! This is my son, my daughter-in-law, my daughter and me, ready to scale the waterfall!! *To get the most juice out of your lemon, leave out at room temperature overnight (if you have stored in the refrigerator). Just before squeezing the lemon, roll it, with the palm of your hand, back and forth. Trust me, it works! My favorite lemon squeezer, it is easy to use and clean up. Made by Chefn. Cut the lemon in half, put half in the bowl of the squeezer, cut side down.. Pull the arm down and squeeze into your vessel. * Dijon Chicken on Monday! * Pictures from the quilting class will be posted on tomorrows blog! Super! Raaaaght! We are thrilled that we have been blessed with six son and daughter in-laws, that are great! And bring so much excitement and fun to our family!! I am so happy you are enjoying the blog! It has been in my head for some time, so now I am up and out! !